It may come as a surprise that naming objects and places in our solar system is not an entirely arbitrary, or scattershot process. Historically names have tended to be assigned by those discovering new planets, moons, or other bodies, and have tended to follow themes. That trend continues today, but does actually have some oversight by the International Astronomical Union (IAU) - at least for the official names that wind up in the history books. Of course the solar system is a big piece of real estate, and the more we explore, and the closer up we get to many of the nooks and crannies of the objects out there, the more names and themes we have to come up with. A good recent example is the asteroid Ryugu (or 162173 Ryugu to be exact). The target of the Hayabusa 2 mission (currently in progress) is a kilometer wide object with a rugged, pebbly-bouldery, lumpy surface. 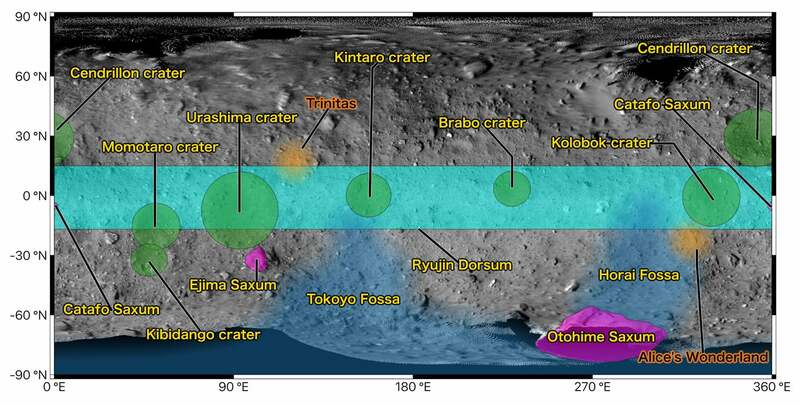 And thanks to Hayabusa 2, Ryugu now has a sufficiently high-fidelity map of its surface that it makes sense to come up with names for regions and particular features. As described in an utterly charming post at the mission site, the theme for Ryugu names is “names that appear in stories for children”. Since Ryugu is itself the name of a magical, underwater, 'dragon palace' in the Japanese folktale of Taro Urashima, this makes a lot of sense. A few points are worth noting. 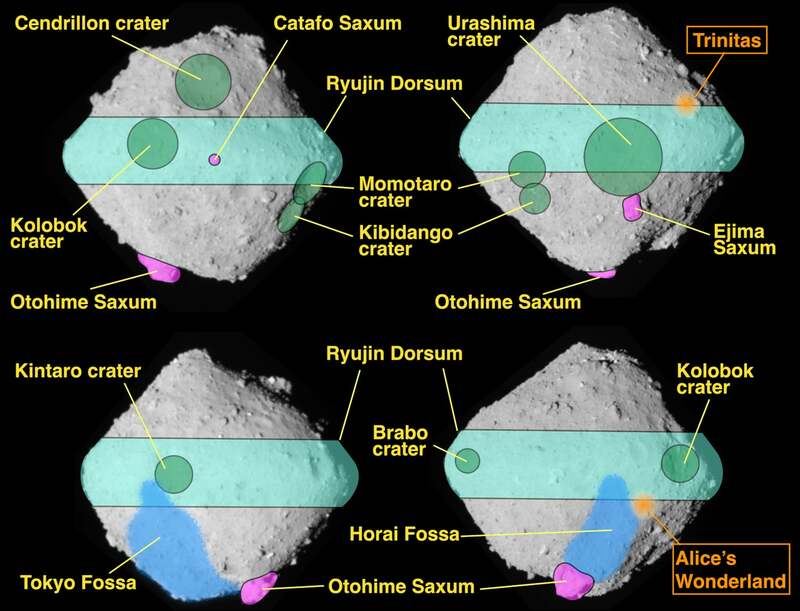 The 'Alice's Wonderland' and 'Trinitas' regions are landing zones for two of Hayabusa 2's rovers. Also, the terms like 'Saxum' and 'Fossa' actually refer to types of terrain (in this case boulders and grooves respectively). But a name like Ryujin is after the "Dragon god who is Princess Otohime’s father", and Kintarou is "The child with super strength who grew up on Mt Ashigara", or Momotarou: "The boy born from a peach who fought against an ogre" (perhaps my personal favorite). Many more details are available at the Hayabusa 2 site itself. Of course, these names have little to do with the ongoing, and very exciting, scientific program of the mission - now emerged from the far side of the Sun from our perspective after a period of hiatus in communication blackout. But there is something fascinating about this reminder of how we humans like to, perhaps need to, cast pieces of our own lives onto the universe. Names are helpful conveniences of course, but they definitely also have a deep resonance across our varied cultures. Somehow we can bring such remote places a little closer by attaching them to our favorite stories and ideas.